Robotic Assisted Navigation | Jeffrey M. Lawrence, M.D. Most patients with knee arthritis have a deformity of alignment that makes them either “bow legged” or “knock kneed”. Dr Lawrence uses a Robotic–Assisted Navigation System that helps to better align the center of the hip, knee and ankle and to balance the ligaments of the knee. This tool is similar to the GPS system that we use to navigate the roads. Two pins are placed into the end of the femur (thigh bone) and two pins into the top of the tibia (shin bone). These pins hold markers that are read by a camera that feeds into a computer. The computer directs us to use a pointer (also with markers for the computer) to identify important landmarks on the knee, and the computer morphs a 3D model of your knee anatomy and leg alignment based on the collected data from the pointer. A robotic tool (BalanceBot) is placed into the knee and tensions the ligaments so that we can balance the inside and outside of the knee more predictably throughout the whole range of motion. We can actually individualize the ligament balance that is best for your particular anatomy. This data is sent to the computer, and then Dr. Lawrence will virtually position the implants on the computer screen. 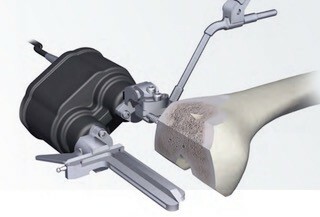 The plan then is sent to a small robotic tool that will move into position and assist with making the bone cuts based on the plan from the computer. This technology has been a great tool to align and to balance a knee in a very consistent and individualized way. We are one of 6 centers performing outcome studies that have shown more rapid recovery, better patient satisfaction and better range of motion with this technology. Vernon Memorial Hospital has become a learning center for this technology, and to train other surgeons regarding it’s use. Dr. Lawrence also travels around the country to teach this technique to interested surgeons.